Fashion designer and former Spice Girl Victoria Beckham and former footballer David Beckham's daughter, Harper Beckham, turned six on Monday. 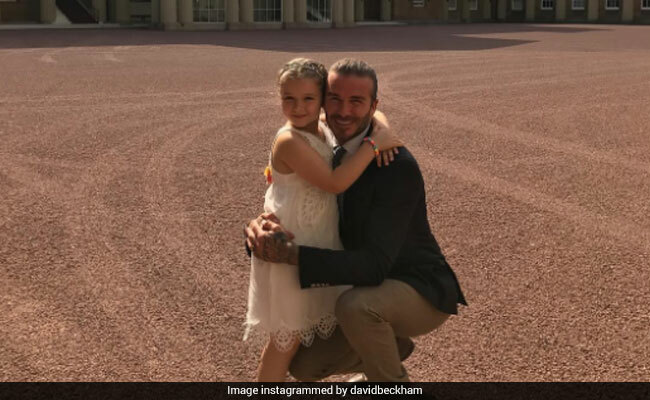 Fashion designer and former Spice Girl Victoria Beckham and former footballer David Beckham's youngest child, Harper Beckham, turned six on Monday. Her parents took to the photo-sharing platform Instagram to share a series of pictures from her birthday celebrations that have since gone viral. Harper attended a tea party at Buckingham Palace ahead of her birthday, dressed as Elsa from the Disney hit film Frozen and even took pictures with a "real-life princess." The pictures have been viewed millions of times and have provoked a flurry of reactions on social media. According to the Daily Mail, Harper and a few of her school friends were treated to an "exclusive" tea party by Prince Andrew and his ex-wife Sarah Ferguson, the Duchess of York, ahead of her birthday. The Beckhams posted pictures of their visit to Buckingham Palace to Instagram only yesterday. "Just to be clear this wasn't a case of the palace opening the gates for Harper's birthday party," Mr Beckham clarified in one of the photo captions. "This was a tea party where us and other guests were invited, so it was a beautiful thing to do with my mum, Harper, plus a few school friends." He added that they were "honoured" to be there. One of the pictures posted on Instagram featured an appearance from "real-life princess," Eugenie, the daughter of the Duke and Duchess of York, who knelt down on the floor with her arms around two of Harper's friends. In another picture, Harper was pictured in front of Buckingham Palace dressed up as the animated character Elsa, holding a bright red balloon. "A birthday party at Buckingham Palace?" asked one person on Instagram. "Bit much," another added. Many people, however, shot down comments like these on Instagram. "People really need to stop being jealous. If I was at the palace Instagram would have seen all my pictures too. @davidbeckham didn't post anything to suggest a 'so there' or I'm a better person than you. Perfectly innocent and what proud Father shouldn't? If you don't like it. Don't view it," commented one person. "People need to be serious and realise the Queen isn't just going to open the gates for you to have your daughter's party at Buckingham Palace. They should have used common sense to realise it was an organised event," wrote another.